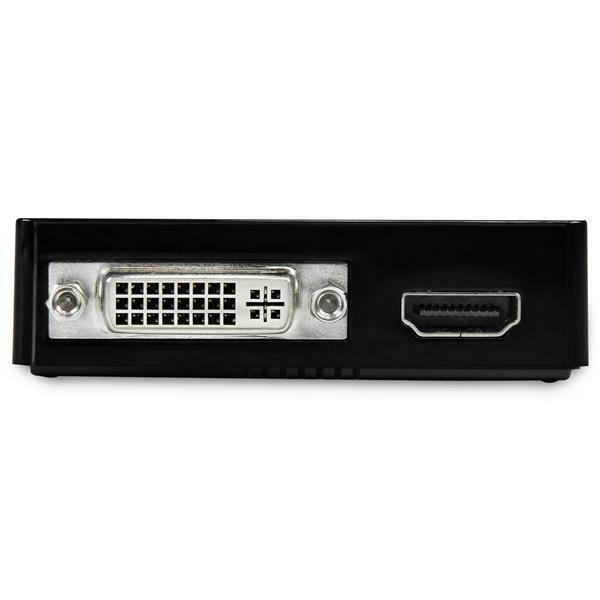 The USB32HDDVII USB 3.0 to HDMI® and DVI-I Dual Head Adapter turns an available USB 3.0 port into one DVI-I or VGA port (DVI to VGA adapter included) and one HDMI® output, with support for high-definition 1080p and 1920x1200 video and 5.1 surround sound audio (from HDMI® port only). Each display can simultaneously support the maximum resolution of 2048x1152 @ 60Hz. The adapter delivers a convenient external video solution that makes it easy to add multi-monitor capability to a USB enabled desktop or laptop computer (optimal performance from USB 3.0, backward compatible with USB 2.0). 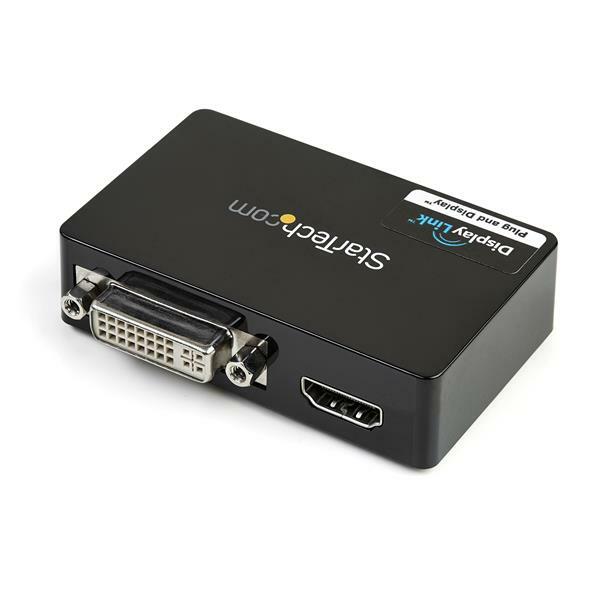 Leveraging the high-bandwidth (5 Gbps) SuperSpeed USB 3.0 interface, the USB video adapter functions as a convenient external graphics card that eliminates having to open the computer case for video card installation. The adapter delivers smooth, high definition content to multiple displays and can be used to mirror your primary desktop, showing the same image on each display, or to extend your desktop onto a second or third monitor to double or triple your workspace and increase your productivity. 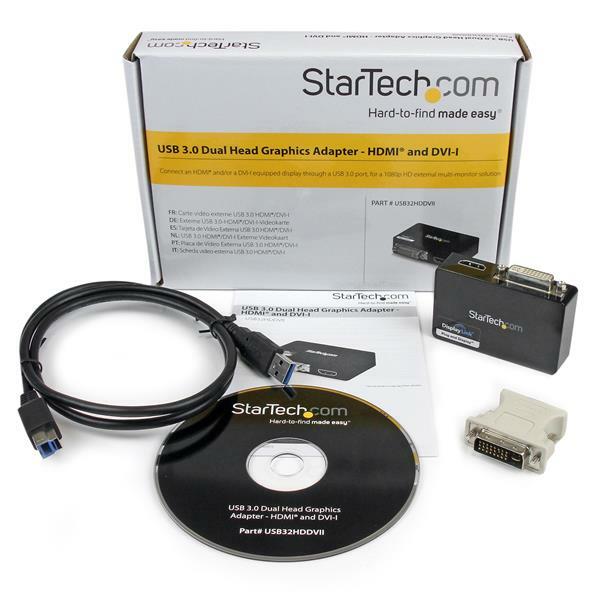 The USB 3.0 HDMI® and DVI-I Adapter is backed by a StarTech.com 2-year warranty and includes free lifetime technical support. General Specifications This USB video adapter uses a DisplayLink family chipset. If you’re connecting this device to a computer along with additional USB video adapters or docking stations, please avoid using devices with a Trigger or Fresco family chipset. Note If using OS X 10.8, Apple update 10.8.3 must be installed before installing DisplayLink software. 10.8.3 fixes several serious OS X bugs exposed when DisplayLink software is installed. Prior to installing this device, make sure that your operating system is up to date (for example, you have installed the most recent service pack). Note: If the Run as Administrator option is not available, you might be attempting to run the installer from within the zipped file. Please extract the files using the instructions in Step 2. How do I install my USB video adapter in Mac OSX 10.8.x - 10.12.x? Note: Do not physically connect the USB video adapter to your computer until instructed to (Step 7). Once Mac OS X has restarted, connect the USB video adapter to your computer. Note: Installation might take several seconds to complete. During the installation your display might flicker; this is normal. Once the installation has completed you will see your Macintosh desktop extended to the additional monitor. How do I install my USB video adapter in Ubuntu 15.0 (kernel 3.16)? To install your USB video adapter in Ubuntu 15.0 (kernel 3.16), you need to download the Dynamic Kernel Module Support (DKMS) package and the adapter driver. On your desktop, click the Ubuntu icon, type terminal, and then press Enter. Type sudo apt-get install dkms, and then press Enter. 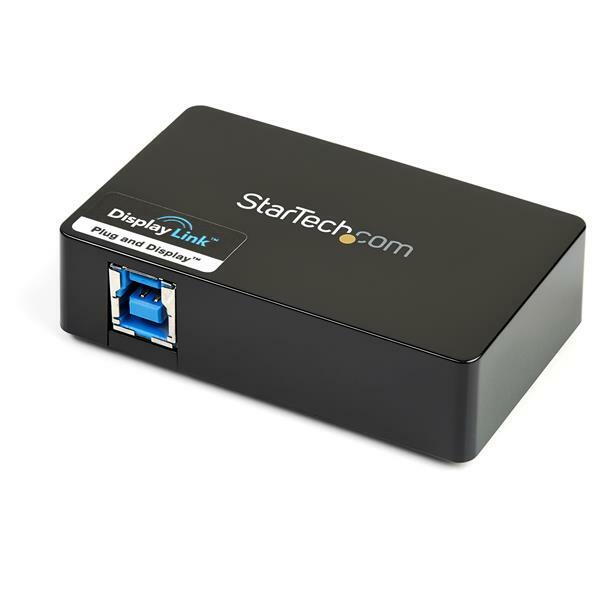 Download the latest drivers from the StarTech.com website (www.startech.com/Support). You can find the part number and product ID on the product packaging. Note: Ubuntu typically saves files to the Downloads folder that is associated with your user account (for example, ~/Downloads). When the download is complete, open the zip folder that you downloaded and click and drag the Ubuntu folder to your desktop. Click the Ubuntu icon, type terminal, and then press Enter. Type cd ~/Desktop/Ubuntu, and then press Enter. Type chmod 755 displaylink-driver.run, and then press Enter. Type sudo ./displaylink-driver.run, and then press Enter. When the driver package finishes installing, restart your computer. To restart your computer from the terminal window, type sudo reboot, and then press Enter. When Ubuntu finishes restarting, connect the USB video adapter to your computer. Note: It can take several minutes to complete the installation. During this time, your display might flicker, but this is normal behavior. When the installation is complete, your Ubuntu desktop is extended to the additional monitor. How do I uninstall my USB video adapter in Windows Vista / 7 / 8 / 10? Unplug the USB video adapter from the computer. Click Start > Control Panel > Programs > Uninstall a program. Note: In Windows 8 and 8.1, press the Windows key + X instead of clicking Start. Right-click DisplayLink Core Software and choose Uninstall. Note: There are two DisplayLink entries in the list of programs. When you uninstall DisplayLink Core Software, all DisplayLink entries are uninstalled. Runs off both my dell laptops on windows 7/8 against all my 24" monitors. Works perfect everytime. No slow down on the system itself, it just works. Do you have a driver update to yosemite on this product? I have used the USB32HDDVII for about 9 months with no problems. Then, last week Windows did an update and this adapter no longer worked due to driver issues and conflicts. Curtis in support spent over 1.5 hours with me on the phone and helped resolve the issue, including resolving conflicts with software from other vendors. Curtis was obviously well trained, astute and friendly. Now that my computer is updated and conflicts resolved, the adapter works even better!!! This is truly a plug and play device. We just attached it to the USB 3.0, attached our two monitors to the device and everything worked. Excellent! The device was also much smaller than I had envisioned, which is great as it takes minimal desk space.